Rural farmers on the Demerara’s East Coast in Guyana are hoping that the rains quickly come or else they stand to lose millions invested in farmlands for rice and cash crops and they want the government to do more to help them cope with the extremely dry weather brought about by El Nino. Some of them have already suffered losses. Saying that this is the worse they have seen so far, the farmers are not unaccustomed to drought-like conditions, having experienced another severe bout during the late 1990s. But they say that they are harder hit because of the reduction of economic activities for them to turn to during times of drought. “We used to come to Hope Estate for jobs. Now Hope Estate ain’t got jobs for we,” said cash crop farmer Roy Doodnauth. He said that in the past, farmers could have depended on the estate to provide odd-jobs for them during the dry season. Doodnauth said that what he is doing is only making barely enough to reinvest and replant. He said he is not really working for a profit. “What me a spen deh, me a jus do it fuh rotate. If mi spen twenty dalla, me a jus mek one thirty dalla,” said Doodnauth. 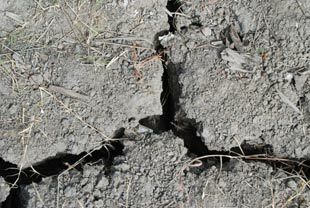 “Right now this dry weather is killing everybody, not me alone,” said Harry Rampersaud, another farmer of Hope Estate. “I have some papaw, some okra and a little boulanger and no water at all, everything dry down,” he said. He added that because of the dry weather, one of his workers had to pump salt water just to irrigate his rice field and he lost half of his rice crop. “We are really punishing, I am telling the truth,” Rampersaud said. Because of the dry season, Rampersaud sustained between $4 – 5 million in damage to his rice, constituting about a third of his crop. He said that to cope, his relatives overseas help him through remittances. At the end of the year, it is expected that Rampersaud makes deposits in the bank so that his relatives could enjoy returns on their investments in Guyana . Another farmer of the area, Rabindranauth Doodnauth said: “The drought treating me bad, because right now me ain’t really got nuttin. Me get lil banana, lil boulanger and it’s best me left um.” He explained that it does not make sense to be spending money to pump water and not be able to reap the produce. “Sometimes for the week me have to pump $3,000 or $4,000 in gasoline. When I harvest, I only make around $4,000. It is like I am just exercising,” he said. A government statement said that according to information from the Guyana Hydro-Met Office, the El Nino phenomenon is not quite over and may likely continue throughout early June. Cabinet Secretary Dr. Roger Luncheon noted that the government is attempting to minimise the effects through nationwide interventions, but this will not erase its impact. He disclosed that an assessment would be done to evaluate the loss suffered by the farming community. Lionel Wordsworth, chief executive officer (CEO) of the National Drainage and Irrigation Authority (NDIA), has been monitoring the storage level in the conservancies to sustain gravity flow irrigation. The NDIA has also been pumping water into the Perth-Baiboo Canal to ensure a reliable source of fresh water. According to Wordsworth, water is also being pumped from a creek at Boerasirie, East Bank Essequibo, into the primary irrigation channels allowing water to flow to other areas in Region Three. “Even the source from which we are pumping is drying out so we have placed an excavator and pontoon to dredge the conservancy,” the CEO explained. The government has been making timely interventions to safeguard the livelihood of farmers since the El Nino weather conditions began almost one year ago. In March President Bharrat Jagdeo announced that a further Guy$258 million would be made available to support the Ministry of Agriculture’s relief efforts to assist farmers. That money will be spent to provide planting materials for cash crops, portable water tanks to communities in desperate need, and acquisition and distribution of chemicals and pesticides. According to the Ministry of Agriculture, cattle farmers whose livelihood has been put at risk because of the extreme dry season have received feed and veterinary supplies.